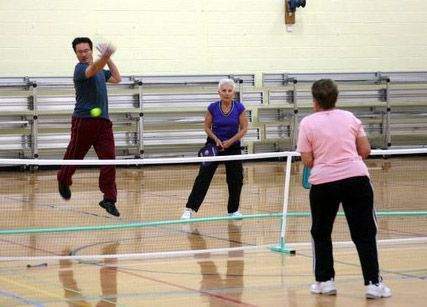 Aiken SC: Several years ago, Mike and Loretta Beckner moved to Aiken and brought with them the sport of pickleball. Now, H. Odell Weeks Activities Center is the site of the Palmetto Doubles Invitational Pickleball Tournament on Saturday and Sunday, with 108 players coming from around to country to participate. “It can be very exciting, if you have four people at the same level, obviously,” Beckner said. This weekend’s tournament, which begins Saturday at 9 a.m., has been set up to achieve just that. The teams are men’s, women’s and mixed doubles teams and have been divided based on age – 19 through 49, 50 through 64, and 65 and older – and skill level. There are 24 men’s teams, 24 women’s teams and 47 mixed teams. While Beckner said that none of this weekend’s competitors are as young as 19, there are some that are in their early 20s.